Three in one function:air humidifier, air filter and oil-water separator, so your air compressor don't need an oil-water separator when you use this set. The air is from the air compressor which is placed in pollution-free environment, so you can avoid having direct contact with poisonous gas, fundamentally solves the difficulty in breathing. Besides, you don't need the cartridges and the filter cottons. 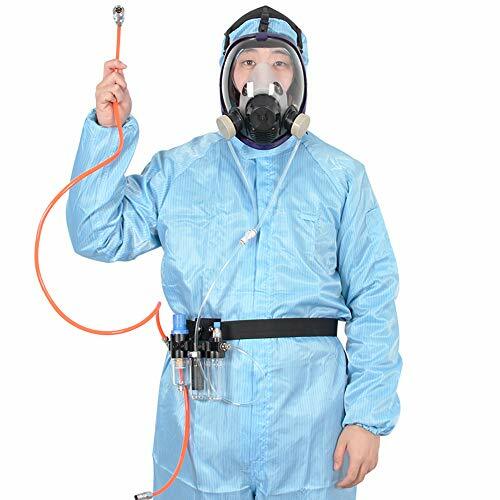 When using this set, It's forming positive pressure inside the mask, which makes the external toxic gases will not enter and keep internal air circulation at the same time, solving the fuggy problem and sweat problem! This set brings you safe and convenience. 1.Inlet interface is made of copper nickel plating, having the features of long service time, durable and high temperature resistance.Service time is 3 times as inlet interface made of common plastic materials. 2.Three direct links which contact with the mask is made of high quality material.The service time of it is 5 times as the service time of common black three direct links. 3.The tube is made of high quality imported materials.So it is more soft and durable. Air supply tube length: 1.6 m/ 63"
The tube for the gas mask length: 0.9 m/ 35.5"
Size of connector for the air compressor: Standard 20 mm Quick Coupling. Size of connector for the spaying gun: Standard 20 mm Quick Coupling. 1.The air compressor is not included and this set must be used with the air compressor. PLENTY OF AIR IN THE MASK---- Compared to self-suction filter-type mask, the greatest advantage of GM14 supplied air mask is plenty of air in the mask. By using it, you don't have to breathe hard when you work. THREE-IN-ONE FUNCTION------ Air humidifier, air filter and oil-water separator are included in this supplied unit, so It can filter down the harmful gas and the oil. This unit has CE certification which ensure good quality. FDA TESTED----Mask goes through a series of lab testing (FDA) to ensure quality and safety for you. This ensures that the material of the mask is safe and reliable. SO CONVENIENT----You just need to connect the unit to your air compressor when you work. Don't need the cartridges and the filter cottons any more. If you have any questions about this product by Trudsafe, contact us by completing and submitting the form below. If you are looking for a specif part number, please include it with your message.